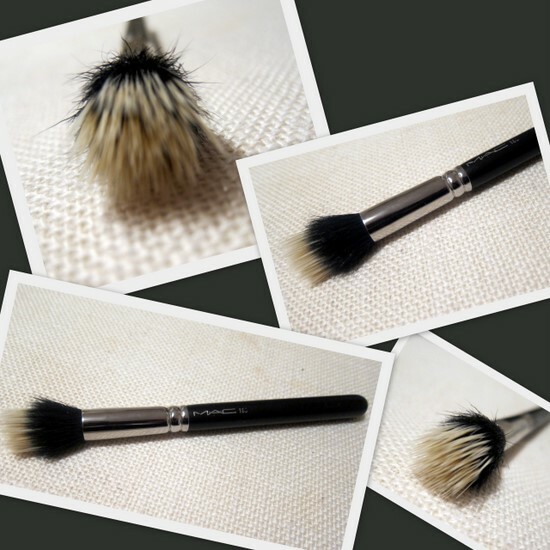 I've been selectively growing my brush collection since I last showed it to you on the blog. After falling head over heels for this foundation then reading this post, I had to invest in a brush to make sure I was doing the product full justice. 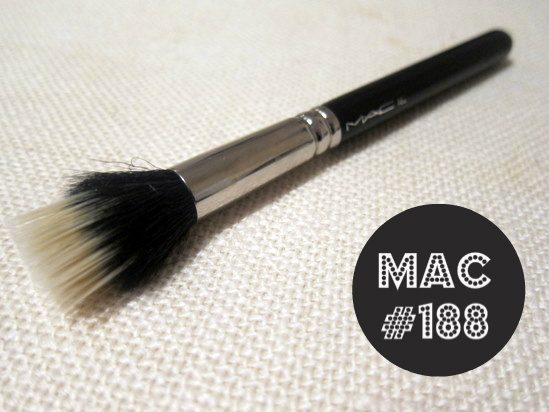 And I'm glad I did because the brush I ended up with, the MAC 188, has fast become one of my favourites. This small duo fibre brush is described on the MAC website as 'a flat-topped, full circular brush used for lightweight application and blending of any formula colour – fluid, cream, powder or pigment. Ideal for creating soft layers or adding textures." It's made from a soft blend of goat and synthetic fibres and is the smaller version of the 187, which I also looked at. But I figured that the 188 would give me more control and can be used for things that the 187 is too large for, like highlighting, contouring and applying cream blush. I've used it for all these things and it works great, but mostly, I reserve it to buff on my foundation (it's what I used for these pictures here). Now, I've applied my foundation with my fingers my whole life, and old habits die hard. So I don't use this brush every day, even though it's quicker to use than its small size suggests. But for evenings out or big days at work when I want to look my best, I turn to the 188 and I love the refined and polished finish it provides. It doesn't drink up too much of the product and provides medium coverage, that can be built up if required. At €40 this is not a cheap brush, but I look on it as an investment and I'm really happy this is in my kit. Are there any other must-have brushes I should know about? You can't underestimate what a good brush can do to the finish of your make-up! I've read a lot about this one, must invest! It sounds great! I bought a Gosh duofibre brush last year and love using it for liquid and cream blushes and for applying my gel bronzer from The Body Shop. It's so gentle and gives a really even coverage, love me some duofibre! Eh, I have two big ones from Bobbi Brown ??! This is why I read your blog Emma ... yours clueless about make-up. That is an unusual looking brush. I've heard MAC brushes are quite good. I don't own a foundation brush since I don't wear foundation. I've never even thought about a brush for foundation application before...I use the Beauty Blender sponges and I love them, but now I'm curious if this would work better. I really want to find out! My brush collection is hideous...I would be embarassed if you saw it! I have the 187 which I love but I'd love to get this for smaller work and cream blush. Someday soon hopefully!